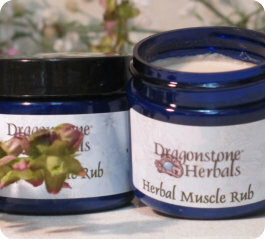 Great for sore muscles, strains, and minor sprains. If you’ve used commercial preparations for muscle or joint pain and inflammation you know that there are some drawbacks ... high levels of menthol or capcasin can help but those ingredients are hard to wash off. And then there are the potential concerns with the non-natural ingredients used in the base product. Wouldn’t you rather use a natural product that not only helps with inflammation but also helps your body heal itself? Our muscle rub is made using a proprietary blend of Arnica flowers, Cramp Bark, Prickly Ash Bark, Borage, Yarrow flowers, and Valerian Root, along with Ginger, Amber, and Orange Essential Oils. Safflower oil is used as the infusion base, and beeswax and an emulsifying wax are used to blend the other ingredients. A preservative is added to prohibit bacterial growth. The ingredients in this rub have customarily been used for muscle, tendon, or ligament pain or swelling. We’ve received reports that it has proven helpful for tight or pulled muscles, strains, headache from stiff neck, and even arthritis. This blend quickly melts on contact with the skin and it spreads easily. A small amount is all that’s needed for each application. The rub can be reapplied as needed and typically lasts 4-6 hours. About the herbs: Arnica flowers and Borage help to shrink the capillaries in the skin and outer muscle tissue to reduce swelling; Cramp Bark, Prickly Ash Bark, and Valerian Root are all warming herbs and help maintain an optimum blood flow for more rapid healing; Yarrow flowers contain a natural pain killer (salycin) and can help to prevent muscle spasms. 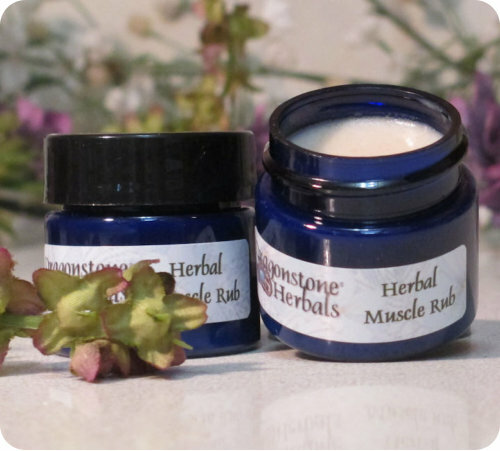 Safflower oil and beeswax are used for the base of this rub. Our rub is available in 4 ounce plastic jars (not shown), 2 ounce plastic jars (shown above), and 1/2 ounce plastic jars (shown left) that are perfect to toss in a bag or purse. Store in a cool, dark place. Warnings/Precautions: For external use only, do not ingest. Do not use if allergic to aspirin or any of the ingredients. Do not use on broken skin or mucus membranes (nose, mouth, eyes). Discontinue use if irritation or redness occurs. Wash hands after applying. If application to the hands is required, the use of a cosmetic sponge for applying is helpful (thanks Dad! ).